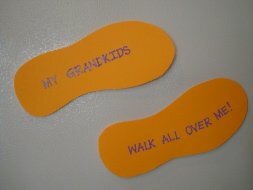 These adorable Foot Print Magnets are a perfect gift for a Grandparent or for someone special. These would even be fun to do with your baby, change the words to suit the occasion! 1. Trace each foot print onto cardboard or cardstock paper. If you are using cardboard try tracing the foot prints onto colored construction paper first so your magnets aren't brown. 2. Cut out each foot print and if you wish, write on your special message. Apply a magnet to the back of each foot print. Another, more messier, option is to brush the bottom of each foot with paint and press it onto the paper and then cut around it.